In Storm in a Teacup you will find environmental and cyclical themes of life and death, renewal and decay, hope and fear, light and darkness. This story takes the form of a poem that tells of a teardrop which finds its way out to sea and finally returns through nature’s cycle to a boy and his grandfather. This is an intriguing and evocative resource for parents, teachers, counsellors, environmentalists and art therapists. It can be used in classrooms, workshops and groups to build conversations about meaning and change. No two readers will interpret this picture book the same way. 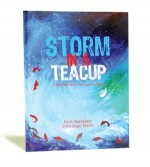 The intensity of Chris Sage-Marsh’s richly hued, deliberately scraggy illustrations make this a memorable and stirring picture book to use with adults and children.Storm in a Teacup also comes with a generous Learner’s Guide full of suggested activities, creative prompts and topics for discussion. Towards the end of last year I was looking for a class activity for my Year 8 art students. A friend had recently sent me copy of Storm in a Teacup (out of the blue) so I read it and discovered the fabulous notes in the back of the book. I ended up reading the book to the kids in class. We had a conversation about place as suggested in the notes: Did you have a special place as a child? Do you have a place like that now? Is it real or imaginary? The students were surprisingly forthcoming with their responses. Each student then produced a mixed media collage representing their special place. All the kids were really into what they were doing. It seemed to hit a creative nerve. What began as a end of year ‘fill-in’ kind of exercise became a really memorable experience. The artwork by Chris Sage-Marsh is simply beautiful. 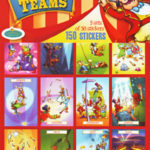 ‘Picture Book – Storm in a Teacup,’ Extra Books, The Sunday Age, 24 July 2005, p. 19. John Holton, ‘A Tearful Journey Worth Taking’, More Weekend, The Bendigo Advertiser, 28 May, 2005. When asked what makes a great picture book, American author and illustrator Lois Ehlert once said that ‘the art and text must go hand in hand, like inseparable lovers’. When you pick up Storm in a Teacup, the latest offering from St Luke’s Innovative Resources, you sense that Ehlert would see its words and pictures as a match made in heaven. Written by Bendigo musician and author, Chris Townsend, this hardcover picture book follows the journey of a teardrop as it falls into a teacup, is washed down the drain, into a river and eventually to the open sea. Finally, via the cycles of nature, it falls as rain and drives a frightened boy into the arms of his beloved grandfather. Given its powerful themes of life and death, decay and renewal, and the gifts of one generation to another, it was no surprise to learn that the book’s evolution was equally ‘organic’. The idea began as an environmental studies project the author undertook many years ago, but after a powerful dream about his late grandfather, Townsend experienced an overflowing of emotion and creativity. ‘I had one almighty dream while travelling alone in Southern India,’ he says. ‘It culminated in the familiar figure of my late Grandfather walking forever towards me with his distinctive gait and smiling warmly in approval of my life direction. Coming to me when it did, this dream helped me see my physical journey as something of an initiation. His friend and visual artist, Chris Sage-Marsh, read the poem and responded by producing thirty original paintings. It was a gut response, long before any thoughts of a book had been entertained, and is no doubt one reason why Storm in a Teacup resonates so deeply. Chris is an arts educator with a strong interest in the use of art in the process of healing. In her classes and workshops she encourages people to explore their own stories using visual metaphors. The emergence of illustrated poetry as genre over recent years has taken the picture book into new territory. Highly metaphorical books such as John Marsden’s The Rabbits and Shaun Tan’s masterpiece The Red Tree not only caused a stir amongst parents and educators but also created important conversations about change and meaning in people’s lives. Innovative Resources has taken this idea a step further by including extensive learning notes at the back of the book to deliberately kick-start meaningful conversations and present possibilities for group activities including creative writing and visual art. The book covers vast territory and can be used just as effectively as a counselling resource for those experiencing grief and loss, as it can in the classroom of an environmental studies teacher. Other topics covered in the learning notes include relationships, feelings, dreams, family ties, the power of place, growing old, journeys, and the power of the senses to prompt our stories. Storm in a Teacup spills from its covers. It is a book that demands to be read aloud – a book best shared with others – a book that continues to hum long after the covers are closed.